Justin Edinburgh has warned his players they are in for a tough test when they travel to AFC Wimbledon on Saturday (ko 3pm). The Cobblers boss is a huge admirer of Dons boss Neal Ardley and his team, and is well aware of the strengths they possess. Promoted from Sky Bet League Two along with the Cobblers last season, but via the play-offs, Dons have enjoyed a decent season. They are four points and three places above Town, and go into the final 10 games of the campaign free of any relegation concerns, and Edinburgh knows a difficult afternoon lies ahead for him and his players. “Wimbledon have good balance, they have a lot of goals in the team, they bring a physicality and they have good mobility,” said Edinburgh, who took his Gillingham side to the Cherry Red Records Stadium in October, and suffered a 2-0 defat. “I expect a real engaging battle for our team, and certainly our back four on Saturday. Edinburgh has yet to claim a win on the road as Cobblers boss, with the only point won being in the 2-2 draw at Southend United last month. His other results on the road have seen defeats at Milton Keynes Dons (3-5), Walsall (1-2) and Fleetwood (0-3). Those results don’t look pretty, but the Town manager feels they don’t truly represent the form of the team away from Sixfields. “The big thing for me is that we have had some good performances away from home, but haven’t had the points tally that I think the performances have warranted,” said Edinburgh. It is an opportunity for the Cobblers, but they are going to have to be a lot tighter defensively than they have been on the road since the turn of the year, as they have conceded 17 goals in just five matches. Wimbledon have handled life in league one well, haven’t flirted with relegation, and Edinburgh believes the club’s faith in Ardley is key to that. Ardley has been in charge of the club since 2012, and Edinburgh is an admirer of the manager, and the club’s loyalty policy. 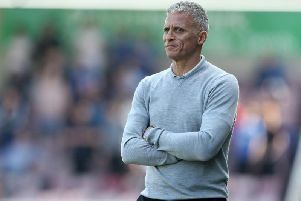 “I came up against Neal in my playing career, he played for the old Wimbledon, and with the reformed club I think they could see he was a focal point of what they were trying to achieve there,” said the Cobblers boss. “He kept them in the League in his first season, and he has built on that. “I think that shows that if you have that continuity and stability then more times than not you will get the success that goes along with that.